It’s been four years since we last saw Swallow Falls, the little town hidden just below the “A” in “Atlantic” on the world map. At that time, the island was recovering from the aftermath of local crackpot inventor Flint Lockwood’s overtaxed “Flint Lockwood’s Diatonic Super Mutating Dynamic Food Replicator” (FLDSMDFR for short). The wacky food machine had created rains of food for the town so sick of nothing but sardines, but a malfunction caused on by the local gourmands brought food hurricanes and spaghetti tornadoes to the island, among other oversized food-based calamities. Flint (Bill Hader of “Turbo” and “Monsters University”) shut down his machine just in time to save the island, and “Cloudy with a chance of Meatballs 2” opens in the moments just following the climax of the first film, when Flint and his band of friends are celebrating their amazing survival. At the start of the film, Flint and the gang – best friend and girlfriend Sam Sparks (Anna Faris of “Movie 43” and “Yogi Bear”), father Tim (James Caan – who needs NO introduction), clueless Brent (Andy Samberg of “SNL”), jack-of-all-trades Manny (Benjamin Bratt of “Private Practice” and “Law & Order”), earnest policeman Earl (voiced this time by Terry Crews of “Arrested Development” and “The Newsroom”), and talking monkey Steve (Neil Patrick Harris of “The Smurfs” and “How I Met Your Mother”) – are sketching their design for their own company: SPARKSWOOD. Each of the group claims a place in their new venture, giving the sense that they will stay together forever. Their happy plans are immediately interrupted by the arrival of a helicopter from LIVE Corp, the primary venture of Flint’s childhood hero: inventor Chester V (Will Forte of “SNL” and “The Cleveland Show”). A holographic Chester V emerges from the copter and explains to the townspeople that LIVE Corp has been contracted to clean up the entire island, and all they have to do is evacuate to San Franjose, where housing and jobs await them for the short period of their displacement. The residents decamp for the mainland – some more grudging than others – and Flint is immediately taken under the wing of Chester V, who brings him on staff at LIVE Corp and challenges him to earn one of the coveted “Thinkquanaut” orange vests by having the best invention of all company employees. Flint throws himself into the challenge with gusto, continuing to invent silly idea after silly idea, including a day-glow, confetti laden party in a box that seems to be an IED from Party City. When Flint isn’t chosen at the “vesting” ceremony and instead accidentally detonates one of his parties in a box, Chester V realizes the time is ripe for the picking. On the pleasant island of Swallow Falls, Chester V’s Thinkquanauts have been working hard to pick apart and find the coveted FLDSMDFR, and they’ve been having poor luck. Chester V seizes the opportunity to recruit the down-and-out Flint to find the machine himself, selling Flint on the idea that the FLDSMDFR has reactivated and has created monster cheeseburgers with french fry legs that are sure to leave the island any minute now and destroy the Statue of Liberty. Although Flint is charged with handling the task alone, Sam and his other friends – even his father – all bundle together on a boat and head out for Swallow Falls to save the world. When they arrive, they find “foodimals”, animals derived from food in rather hilarious ways. Some are merely cute, such as the massively adorable strawberry Sam immediately names “Barry”, and others are built for easy laughs, such as the pickles that are reminiscent of South Park’s Terence and Philip. Plays on words, such as “shrimpanzees”, “susheep” and “watermelephants” provide clever visuals and excellent puns. These jokes may mostly go over kids’ heads, but playing to the entire audience is a really good thing. Flint and co. explore the island and use varied means to locate the FLDSMDFR; Swallow Falls has turned into a foodimal Lost World with more cute than danger – but the number of pitfalls, detours and distractions is by no means small. When Chester V and his second-in-command, the unflappable chimpanzee-turned-scientist Barb (Kristen Schaal of “The Daily Show” and “30 Rock”), head out to the island to intercept and motivate Flint, cracks form in Flint’s fellowship. In the end, it’s up to more than just Flint to find a way to save Swallow Falls and his search party, and this sweet, cute film finds a way to wrap things up without putting little kids on the receiving end of too many scares. I brought both of my kids to this screening, so I can say that little kiddos don’t appear to have too much to worry about from this film; there’s little frightening in it and the jokes are aimed more at adults than at kids (sailing well over the heads of my 4yo ds and 6yo dd). As to the question of whether this is a movie that should be seen in 3D, I can say that the 3D is nice but not required. The bright visuals would look just as good in 2D, and the added depth of the 3D is attractive but not necessarily worth the additional cost, if you’re not typically inclined to paying for 3D movies. 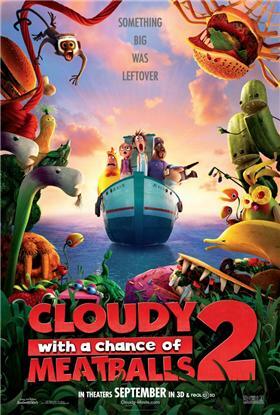 “Cloudy with a chance of Meatballs 3D” opens nationwide on September 27, 2013. This movie is rated PG (Parental Guidance suggested) for mild rude humor. This entry was posted in movie reviews and tagged barb, chester v, cloudy with a chance of meatballs, FLDSMDFR, flint lockwood, foodimals, movie, movie review, sam sparks, Thinkquanauts by crunchymetromom. Bookmark the permalink. I literally just picked my 14 yo up from the theater where he watched this. I thought it would be funny and he didn’t think so. But, he agreed with you completely on the 3D aspect!